This is my first post here, and I'm always been a bit uncomfortable with posting my work anyplace, however this is a preliminary for a cover. I am always trying to improve my work. I know it is hard to understand without its story perhaps, but perhaps when the story this goes to is complete I will post it here as well. Last edited by Mr. Average on Tue Jan 12, 2010 11:04 am, edited 2 times in total. Thanks! I'm glad that character was immediately recognizable - my concern was that he would look like a man-in-a-suit rather than totally mechanical. In early sketches he was too "bulky" and his face looked like a mask. This is another bit of preliminary work for the comic. More preliminaries - a tender moment from Hotel Metropolitan. This is my first story with heavy emotional content, and I had to start proving to myself that I could draw it. This is an illustration a friend of mine asked me to do for a short story he's writing called The Angle of Eternity, which is in a Lovecraftian mode. This creature actually existed once. 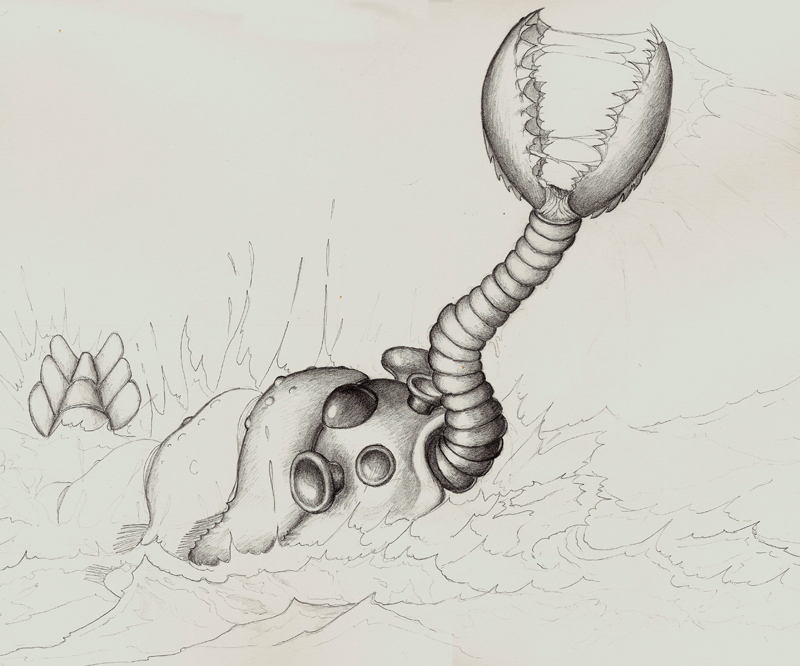 It was called an Opabinia, and lived in the Cambrian era. Of course, it was miniscule, not the whale-like thing here. But truth is stranger than fiction. This is graphite on bristol paper. Nice pencil monster, insect thing. And your comic cover looks very nice. I'd like to see that coloured up, and scales down a bit so we can see it all onscreen at once. Some preliminary sketches for Hotel Metropolitan. Even though I'm a pacifist, I happen to have a dubious talent for designing firearms. 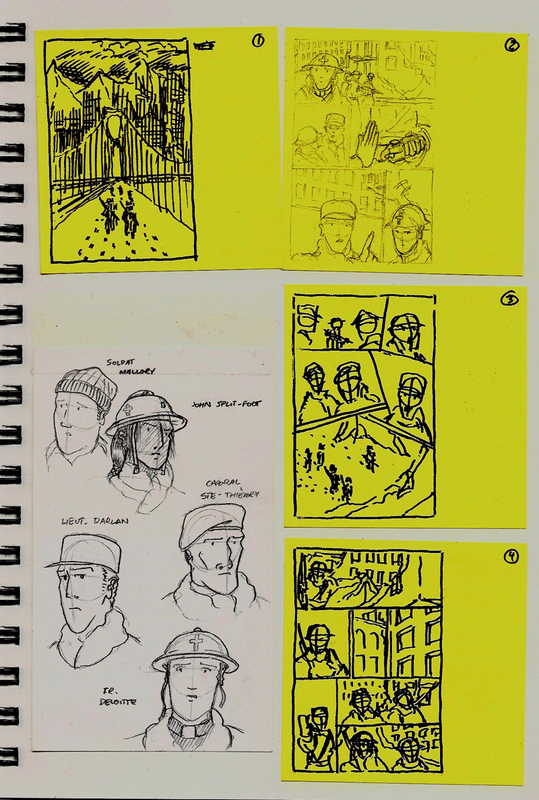 And some preliminaries and layouts for "The Windwalker," an abortive short story I posted one page of here. I am revisiting the project with a friend's editorial help. 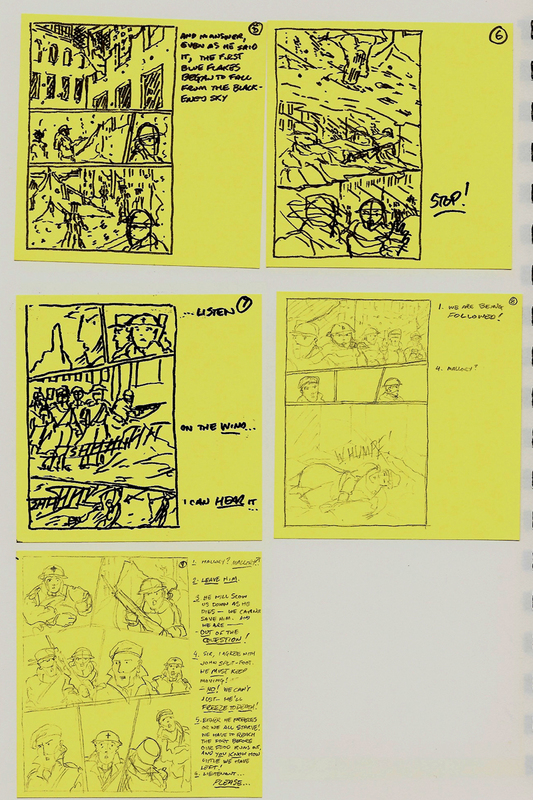 I know they're rough but any comments/critiques on these layouts would be helpful - the project is still "fluid." I like these sketches! Hotel Metropolitan cover is super cool. About "the Windwalker", I think you can make roughs of these pages. They are building this story very well. If you take your time to lay down the rest of the story the same way you have done with these pages, I think it will be great. Joost - thanks for the upbeat response! I know we're supposed to just do this for ourselves, but I still really appreciate the encouraging words. Working in a vaccuum is tough. 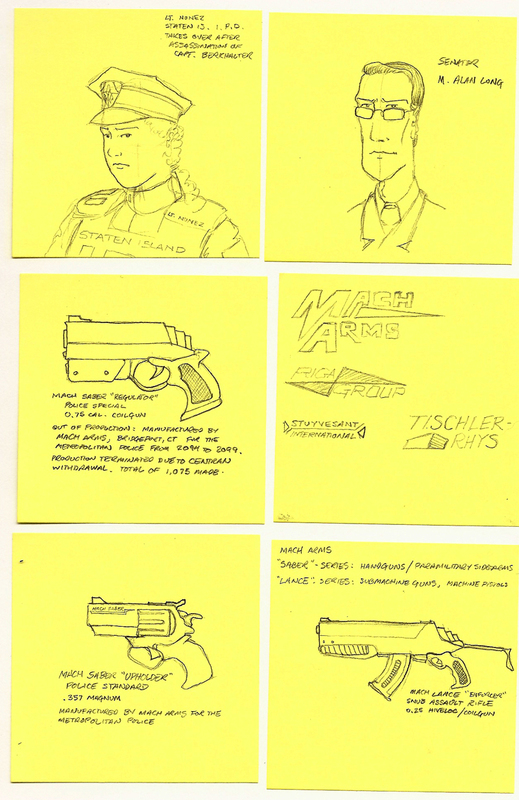 These, by the way, are a few I doodled the other day for another War Story called And The War Was On Again. I've always wanted to do one with airships, so this was a good chance. I see it as a bit more predictable than what I normally write, but I'm going to just doodle and see if it comes to anything. The great thing about these post-its is that they're very low committment. Working in a vaccuum is tough. Yeah, I know. I'm glad my wife can see what I have accomplished when I show her my work in progress, most people around me can't. 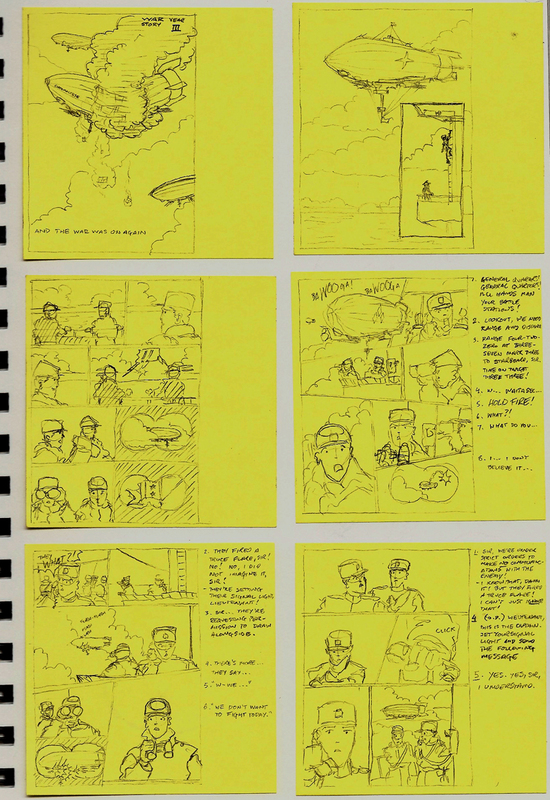 About "The war was on again" I can't really follow the story, because the text you've writing next to it is to small to read (Post-its eh, I was wondering why you where using yellow paper). First 2 pages can/will be stunning if you draw them full-size. 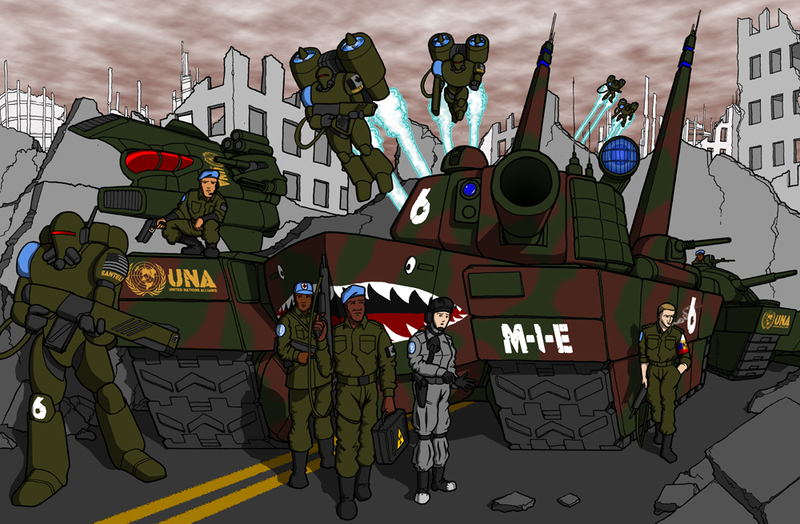 Frontispiece for a piece of "cheeseburger" military sci-fi I'm exploring. I'm coloring it now. 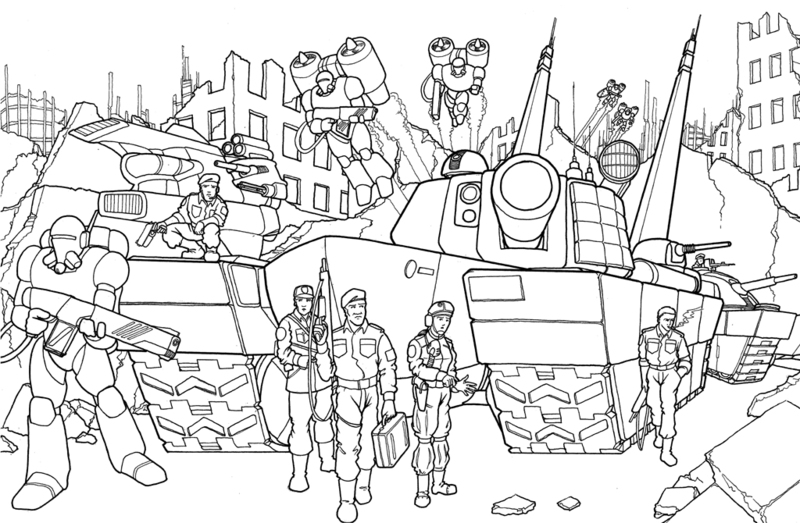 It started off as fan fiction for a VERY old wargame called Ogre/GEV (yes, from the days when "gamers" were people who sat down with pieces of paper and played boardgames). Since then it's morphed into something unique, which opefully doesn't violate any copyrights. We'll see. It's good practice for me anyhow. And now, color! I was shooting for a cartoon cel-shaded look. I think it came out fairly well.